When considering rabbit health, it is important to note that rabbits tend to hide signs of ailing health because they are prey animals. In the wild, sick animals are pinpointed by predators first. This self-preserving instinct to hide illness lives on in domesticated rabbits, so it is critical to continually monitor your rabbit for any changes in behavior. One very serious, fairly common health issue pet rabbits face is gastrointestinal stasis. GI (or gut) stasis is a potentially deadly condition in which the digestive system slows down or stops completely. Bad bacteria then builds up in the intestines and releases gas into the system, causing very painful bloating and further decreasing a rabbit’s motivation to eat or drink. This compounds the problem because the rabbit will become more dehydrated and starved of essential nutrients and roughage. The contents of the digestive tract will become more compact, and the rabbit will have an even more difficult time passing it through. The bacteria can also release toxins into the system which overtax the liver and can cause the organ to ultimately fail. It is also important to provide plenty of fresh hay and greens for the rabbit should he/she get the urge to eat. Providing particularly fragrant greens, like cilantro, may help entice a rabbit who is not overly eager to eat. With these treatments, time, and patience, a rabbit suffering from GI stasis can make a full recovery. But it is important to recognize the symptoms early and take your rabbit to a rabbit-savvy vet immediately for these treatments. There are several measures you can take to help prevent the occurrence of GI stasis. First, ensure your rabbit is getting a proper, hay-based diet. Consult our article What to Feed Your Pet Rabbit for a full list of appropriate foods. A hay-based diet is essential not only because it provides the fiber necessary to keep the digestive system moving, it also helps wear down a rabbit’s teeth which paves the way for better dental health. Read more about the importance of hay in our article, Hay for Rabbits: The Basis for a Healthy Diet. Another way to prevent this condition is to bring your rabbit in for regular veterinary checkups. 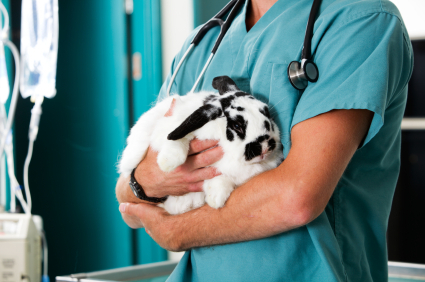 After examining your rabbit, a vet may may be able to detect underlying health issues that your rabbit has so far successfully hidden from you, such as infections or dental problems. Third, evaluate your rabbit’s living space. Rabbits need plenty of room to exercise in a bunny-proofed or supervised area. They do best when they are included in family life, but they are prone to high stress levels when there are major changes to their environment and routine, such as the loss of a bonded partner or an influx of household visitors. So do your best to create a happy, healthy environment for your bunny. In no means should this article be considered a substitute for veterinary advice. The purpose of this article is to spread awareness of a very serious health issue pet rabbits can face. It doesn’t take much time from when you notice changes in diet or behavior for a rabbit’s condition to deteriorate dramatically. In March 2010, our rabbit Cosette suffered from a serious bout of GI stasis. After a few days of in-house treatments at the vet’s office and several days of at-home treatments, Cosette did end up making a full recovery. 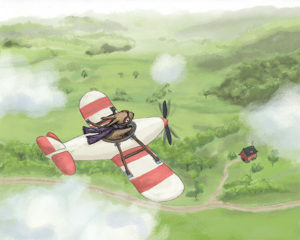 But there were several points during that time where it looked like she was going to take a turn for the worse. Many people have contacted us with stories of their rabbits succumbing swiftly to this condition. So it’s important to know that once a rabbit’s afflicted with GI stasis, there’s no guarantee of recovery. The best course of action is to bring your rabbit to a rabbit-savvy vet at the very first sign. Do not wait and see if they will get better on their own!